Students march down Sheridan Road in a 2017 Take Back the Night march. Administrators rolled out a new sexual misconduct training program for students, which will be available at the end of January. Northwestern administrators are rolling out mandatory sexual misconduct training for students and revising the faculty misconduct training, according to a Wednesday email from Patricia Telles-Irvin, the vice president for student affairs. The training, which the Office of Equity will facilitate, will open Jan. 23 and will be available through Feb. 20. Sophomores, juniors and seniors are required to do the training — first-years already completed a “comprehensive” program at the beginning of the academic year. On Feb. 13, students who haven’t done the training will be sent daily reminder emails until the program is complete. Students who don’t complete the training may not be allowed to register for classes, according to the email. 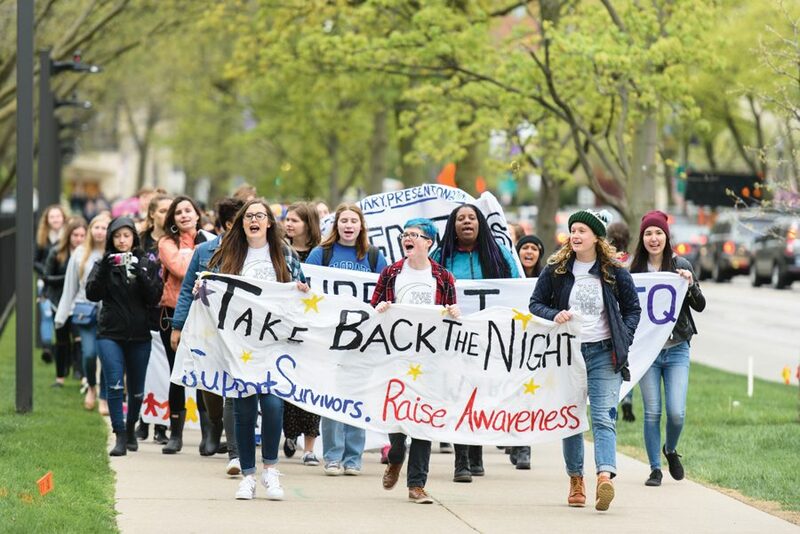 The training is one of many initiatives part of the “Take Care Northwestern” program, which will also include a climate survey on sexual misconduct, Telles-Irvin said in the email. Telles-Irvin also addressed the potential changes to Title IX, which could include increased protections for those accused of sexual misconduct and assault and make universities less responsible for investigating off-campus incidents. Under the proposed rules, schools would no longer use the single-investigator model, giving defendants the right to cross-examine their accusers. The changes would also narrow the definition of sexual harassment. This has sparked concern among students, who said they are concerned for their safety on campus. Students who feel uncomfortable or unsafe completing the training due to past personal experience may opt out of the program by contacting the Office of Equity, Telles-Irvin wrote.